“Prof. Stefan Stefanov” Professional high-school of construction, architecture and geodesy of Montana was a host of the regional stage of “Best young constructor” national contest which took place on 13th and 14th of March 2015. An official guest of the event was Deputy regional governor Petar Petrov who awarded the winners of the contest. 20 participants from Montana, Veliko Turnovo, Gabrovo, Pleven and Vidin contended in 4 disciplines. Participants from “Angel Popov” Professional high-school of construction, architecture and geodesy of Veliko Turnovo took the first place in the team classification, followed by representatives of Gabrovo’s Professional high-school and “Nikola Fichev” high-school of Pleven. Representatives of Montana took the 4th place, followed by participants from “Vasil Levski” school of Vidin who were awarded the 5th place. Winners in the 4 disciplines were also awarded as Desislava Vitkova from Vidin took the first place in the “Plaster, ground coat and painting” discipline. 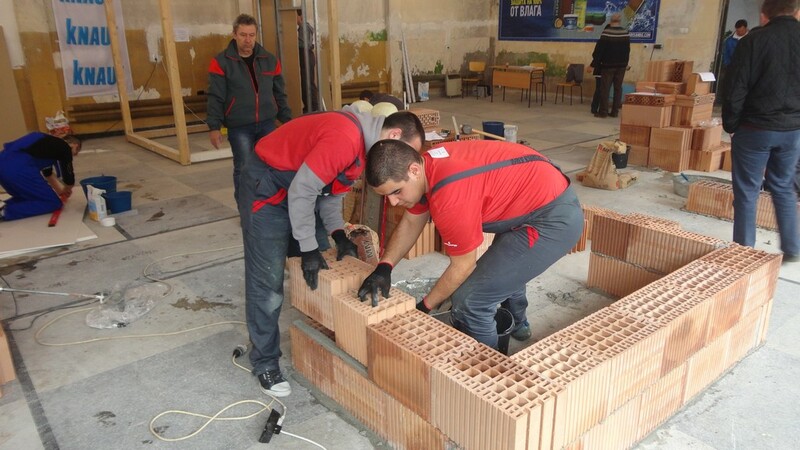 Asen Zlatkov and Venko Ivanov from Veliko Turnovo’s High-school were awarded the 1st place in the “Masonry” discipline. Petko Stanchev from Gabrovo was awarded the 1st place in the “Facing and flooring” discipline as the second place was taken by the representative of Montana Gabriela Biserova. Dimitar Dimitrov and Vasil Vasilev from the professional high-school of Vidin were awarded the 1st place in the last category, called “Dry construction”. All the successful teams and individual participants were given certificates, charters and construction instruments. Leaders of all teams were awarded certificates by the managing authority of “Prof. Stefan Stefanov” Professional high-school of Montana.